Another nice 13th Age review! I finally read my copy of this myself and have to agree that aside from the mastermind’s dull motivation (far too common in low level modules regardless of system, but easy enough to fix), it’s a really nice module. It looks like it really highlights the system’s fun combat system. Between it and Eyes of the Stone Thief, I need to run an actual 13th Age campaign rather than the sporadic one and two shots I have thus far. I recall you disliking 13th Age’s background system from the review of the core book, and here you mention the system’s lack of tools for non-combat challenge resolution. In your opinion is there a D&D style fantasy RPG system that handles non-combat challenges well? I ask because, in my opinion, 13th Age’s non-combat resolution system is no better or worse than Pathfinder’s (even with the few but excellent 3rd party supplements I use) or any edition of D&D and its derivatives. I actually take the opposite view than you of 13th Age’s backgrounds; I enjoy the creativity the system promotes, though it definitely requires a higher level of trust in the GM’s rulings. First of all: Thanks for commenting! Villain motivation: It gets worse once you start analyzing. It makes no sense the villain’s project in the final fight is NOT completed – why initiate the chain of events that start the module without preparation? The assassination attempt is pretty much the only reaction; there is no consequence for eliminating parts of the network and the over all set-up of the conspiracy is much too intricate for what it actually does. No one taught the Lich King’s servants Occam’s Razor, it seems. Once you start to analyze the module, which my players did after playing it, these weaknesses become apparent and somewhat dragged down what was pretty much nice while playing it. If a group tackles things as fire-and-forget, then…well, then it works perfectly. Backgrounds: I *HATE* the skill system of 13th Age. It’s the one thing I absolutely and positively loathe about it. Dislike is too small a word. It boils down to: “I have background xyz and try to BS the DM in letting me roll vs. skill zyx.” It’s FATE. I really, really, really, really hate this design-philosophy. DMs have to remember which backgrounds they let their players BS them into working for which tasks, which turns into a clusterf*** sooner or later. It’s a matter of likes and groups, though. My players are very good at system-mastery and with our preferred level of lethality, sooner or later they *will* be tempted to try this route. It’s why FATE doesn’t work for us. If it works for you, awesome! That’s why I try to not penalize systems for personal dislikes. Skills and Investigations: D20 does not handle investigations particularly well (See GUMSHOE for my favorite system for that…), but I do believe that PFRPG handles it better than 13th Age…with some modification. If you utilize scaling successes (more or less information gained on failed or particularly successful skill-checks), then 3.X and PFRPG work pretty much perfectly – at least in my last 10+ years of playing such scenarios. My issue regarding investigations and skills/backgrounds in 13th Age is that characters are reduced to either background-related BS-ing or relationship dice – there is no scaling here, a component more pronounced in other iterations of d20. And deliberately chosen character capabilities feel more rewarding for the players than the background/luck-component – at least that’s the consensus at my table. EDIT: I also recommend utilizing the skill-challenge-y traps Raging Swan Press sometimes features as a template to create cool non-combat challenges! That being said, the module still does a good job within its limitations, with some minor issues, yes, but still. For now, this btw. does conclude my 13th Age-reviews since I do not have “Eyes of the Stone-Thief” or the small pdfs (yet) – but I do hope I’ll be able to get my hands on that one – it looks like it may be exactly what the system does best! It doesn’t surprise me that the narrative doesn’t hold up under scrutiny, I can’t count the number of books/tv shows/movies I’ve loved in the moment only to go, “Wait a minute, that doesn’t make sense…” moment later while thinking about it. I have to admit, I’m not overly analytical, particularly when it comes to modules; I tend to read them for plot and encounter ideas to fold into my campaigns and anything that doesn’t fit into the overall narrative gets jettisoned completely or repurposed for a different campaign down the line. Not something you can account for as a reviewer! I actually like FATE as well…! I don’t begrudge you your opinion of the 13th Age skill system; it certainly won’t work for every player or GM. My personal liking for it aside, I won’t even consider running 13th Age for one of my two groups as they require a more structured, codified rule set. I also use scaling successes in PFRPG, but the skill system as written still feels like a sadly neglected afterthought, which was also the case in 3.0/3.5. I love GUMSHOE! I’d love to see Robin Laws or Ken Hite create a fantasy or fantastical alternate history game with the GUMSHOE engine! I’ve been trying to convince either of my groups to let me run ToC so I can unleash Eternal Lies upon them… alas, I am not being very persuasive. Thank you again for your reviews! 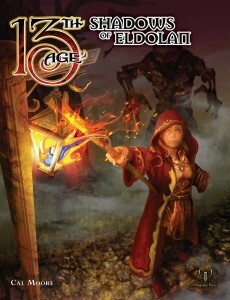 I’ve only been commenting on the 13th Age ones lately, but I read them all; they’ve guided many a purchase. Cheers and thanks for the comments! !